How much EVH mojo can be found in one pot? Eddie Van Halen has been getting his initials put on so many products big and small lately. One of the many things he has endorsed lately is his own EVH Custom Low Friction Pots. So what is so special about these pots? The feel of the pot is very loose without feeling worn out, meaning you can spin the pot around very easily with the flick of a finger. Some have mentioned that these are very expensive for a pot. Comparing the cost of regular brand name ones in Australia I thought the cost was quite reasonable. Looking further in to it though, Bourns is the company that makes the EVH pots, and a Bourns branded one can be bought for half the price. Forgetting about the cost thing for a moment, lets look at the pot itself. They are available in 250K formats for Strat type single coil applications, and 500K for humbuckers. The pots only come with solid shafts which is a little annoying, I didn’t notice this at first when I first purchased the pot. I now have to go and buy a new volume knob. They are not available in long shaft formats either. Bourns do make these under their own name with the option of a split shaft. 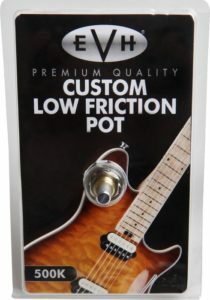 I’ve installed the EVH Low Friction Pot now, and my initial impression is quite good. Even though my Blackstar HT-5 is a 2 channel amp I just stick to using the dirty channel, and using the volume knob on my guitar to control clean and distorted sounds. I quite like the ease of spinning the volume pot to quickly lower and raise volume to control distortion and clean sounds. I’ll be writing a more thorough review once I’ve spent some time using the low friction pot. One Response to "New Gear Day (NGD): EVH low friction volume pot"